We are still waiting for our first significant run of salmon of the fall. It is still early yet, and there is no reason for concern. As of now there has been small trickles of fish entering the river almost daily. What I call by small trickle is maybe a dozen or two individual fish. So we are still fishing for a fish of tow. We did have some hot whether late last week, which caused water to temperatures to spike. This put a stop to any salmon from coming in to the river, and dramatically slowed the fishing in the upper fly zone. Fortunately the recent warm weather did not last long. Water temperatures have cooled off significantly. Hopefully we will see a strong run of salmon soon. The reports coming from the lake is saying that the salmon are slowly moving into shallower water. Only time will tell when we get our first significant run. Until then we continue to fish the lower river in the morning, looking for a salmon. Then finishing out the day in the upper river looking for a summer run steelhead or possibly Atlantic salmon. For flies it is obviously still too early to determine if there is any pattern yet. The salmon and steelhead we did get were caught with the standard stuff, black and brown size 6 and 4 woolly buggers. 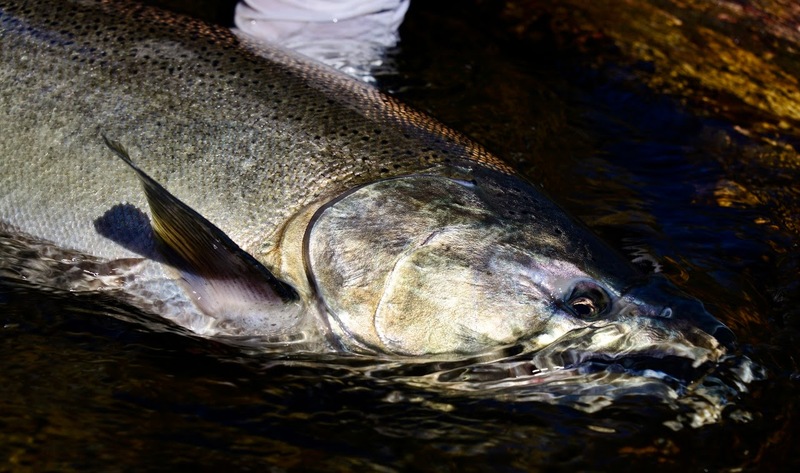 What is more important than the fly is that we cover as much water as possible, upping the ads that we find a fish. Also as always concentrating on making a proper presentation. You do not want to unknowingly walk past active fish while making a poor presentation. Because the numbers of fish that are coming into the river at this time are so low, forcing us to cover a lot of water to find the next pod of fish. I have found the best presentation is to swing flies. This style of fishing easily lends itself to efficiently covering a lot of water while making an excellent presentation. Once again this is why I like fishing woolly buggers, you just can’t make a bed presentation with this fly.